We were a little pessimistic about the weather when we awoke early and were breakfasting on porridge. There was thick cloud from about 500m upwards, but by the time we set off it was noticeably beginning to lift. We began the climb straight up the side of Carn Dearg, which was steep and tiring, but it eventually levelled off by the time we caught up with the cloud. We then also found a path of sorts along the ridge, which was quite handy in the mist. It was pretty cold and there was no view from the top, so we moved on. When we got to the low point before Geal-Charn, we were back out of the fog and could fully appreciate the steep sides and scramble ahead of us - it looked exciting. The narrow winding path took us up onto the plateau and we had fun trying to find the summit in the cloud with nothing to go on apart from instinct and a small scale map. We did find it and as we left, the cloud began to lift - as we made our way to the next peak we had clear views all around. 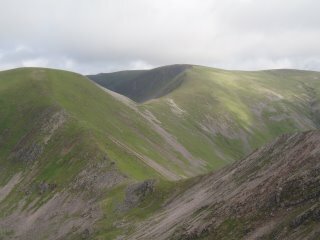 We got a clearer impression of quite how extensive Ben Alder was and we could see our way along the rolling ridge ahead. 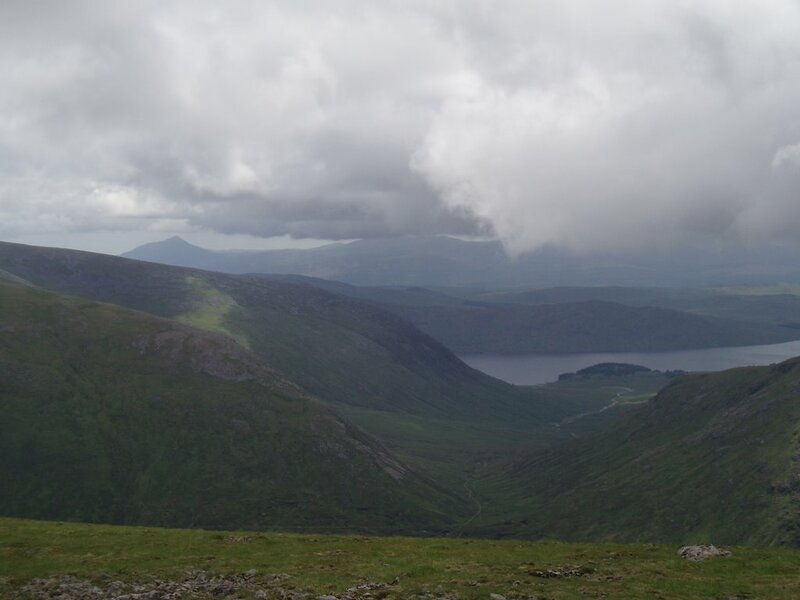 Aonach Beag and Beinn Eibhinn were not far apart and we had reached the top of the fourth munro by lunch time. 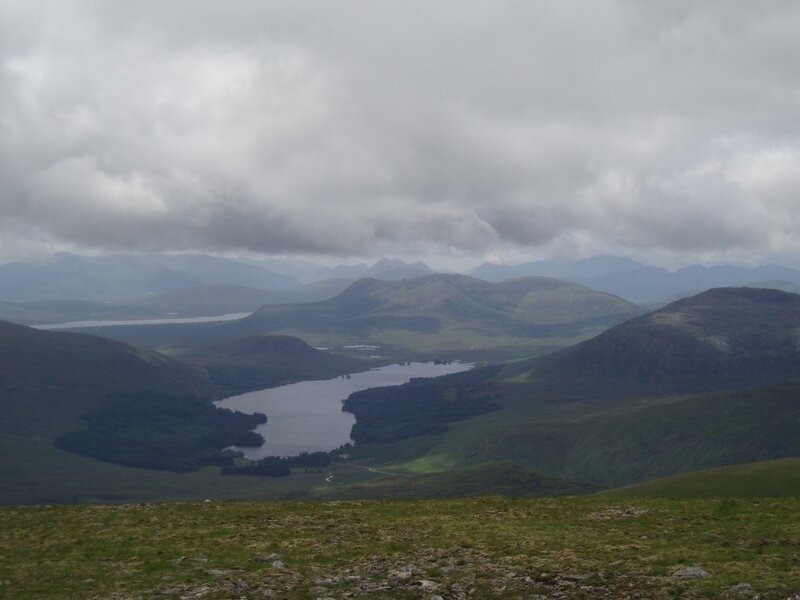 We paused for a while, looking down on our original route through to Ben Alder Cottage and also down to Loch Ossian, with Corrour somewhere in the distance. 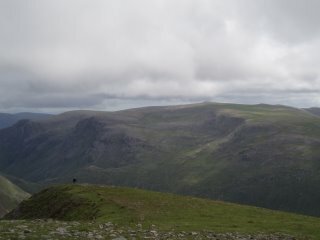 We could also see many peaks out to the north and had a great view back along the ridge. We trampled our way down across the heather back to the track and back to Corrour in the sunshine, easily making the train at 5pm. It had been a great expedition into the wilderness and a good introduction to hills for Christian and Ian. 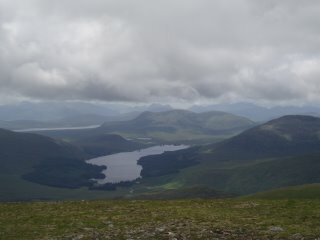 Loch Ossian and Corrour from Beinn Eibhinn.